The Montclair Women's Big Band is an irresistible swing machine which grabs your attention from the first downbeat, showcasing their air-tight ensemble, high-energy rhythm section and big brassy sound. The Montclair Women's Big Band is one of jazz's best kept secrets. Since 1998, the ensemble has upheld a lofty tradition dating back to 1884, when the first "Ladies Orchestra", as they called it back then, was formed in Chelsea, Massachussetts. The Roaring 20s gave birth to bands like the Parisian Redheads, later known as the Bricktops. The Swing era produced bands such as the all Black Dixie Sweethearts and the Harlem Playgirls. Ina Rae Hutton and her Melodears, an integrated band, had to fudge the identities of their members of color , passing them off as white, due to segregation. With many men overseas during World War II, Womens' Big Bands were afforded the opportunity to proliferate, and they did. One of the better known groups was the International Sweethearts of Rhythm, under the baton of Anna Mae Winburn. With the end of the war, the return of the male troops and changing tastes, Womens' Big Bands began to disappear. But by the 1970's, with the 2nd wave of feminism, groups like Ann Patterson's LA band Maiden Voyage were back on the scene. 1980s' New York saw Seeling's collaboration with the Universal Jazz Coalition's Cobi Narita, producing the "Big Apple Jazzwomen," and Sherrie Maricle & Diva continue the tradition from the 90s to the present with their several CDs of big band jazz. 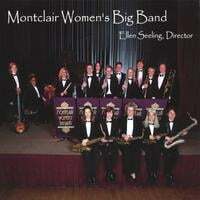 This is the Montclair Women's Big Band's first CD and it's a winner! With Director Ellen Seeling at the helm, the band's grooving rhythm section and outstanding soloists smoke their way through 14 classic arrangements. The band burns on Ernie Wilkins' rhythm tune, "The Brownsville Express," featuring Mad Duran on alto, Christy Dana on trumpet and Allison Miller on drums. The group breathes new life into "String of Pearls" with tenor saxophonist Jean Fineberg and trumpeter Marina Garza. And Vicki Randle's chops go way beyond her skill as the percussionist in The Tonight Show band. Just check out her vocal on "For Once in My Life." From Sonya Jason's alto and Tammy Hall's piano solos on Percy Mayfield's funky "Rivers Invitation" to Seeling's haunting interpretation of Antonio Carlos Jobim's "Quiet Nights," this band can do it all. Not surprising, given Seeling's credentials as a trumpeter, bandleader and jazz educator. For almost 3 decades, Ellen has been keeping us in song and dance, through her participation in bands ranging from Laura Nyro to Machito to the Thad Jones/Mel Lewis Big Band, and of course her own baby, (with saxophonist and composer) Fineberg, DEUCE. What is surprising, however, is how manager and veteran music producer Barbara Price and director Seeling were able to get these talented women - all first class bandleaders, educators and session musicians , together at the same time to record this gem. But I am so glad that they did, for now, we get to enjoy the result! So put on your dancin' shoes and open up your hearts for a wild ride with the Montclair Women's Big Band. They honor the past, paying tribute to the all women's big bands of the 20's, 30's and 40's. They acknowledge the present, putting their own unique, modern day stamp on the music. And they inspire the future, encouraging young girls to follow in their footsteps. They're the cream of the crop and they are not to be missed! A consummate musician equally adept at jazz, R&B, Latin and pop/rock, Director Ellen Seeling has had a multi-faceted career as a trumpet player, composer and bandleader. The first woman to earn a degree in Jazz Studies from Indiana University, the Milwaukee native moved to New York City in 1975. There she toured and recorded with singer/songwriter Laura Nyro, Machito, Ray Barretto, Sister Sledge, Chic, Patti LaBelle, The Temptations, Latin Fever, Joe Cocker and Martha Reeves, among others. Seeling was also actively cultivating her jazz chops, performing with the Thad Jones/Mel Lewis Big Band, the Manhattan Plaza Jazz Composer's Orchestra and the Paul Jeffrey Octet. In the early 80s, Seeling and saxophonist/composer Jean Fineberg formed the jazz fusion band DEUCE, recording their first album of original compositions in 1986 and their second WindJammer ,in 1996. Seeling currently teaches at the Jazzschool in Berkeley, California, and served as jazz clinician for the Pennsylvania State University, the International Women's Brass Conference and the Kansas City Women's Jazz Festival. The recipient of a National Endowment for the Arts Award in Jazz Performance and two Meet the Composer grants, Seeling has also been profiled in Linda Dahl's Stormy Weather (Pantheon Books), American Women in Jazz (Wideview Books), Madame Jazz (Oxford University Press) and the recent Eden Built By Eves (Alyson Books). I grew up during the War years with the Big Band sound so I was absolutely thrilled when I found this band of women. I received this CD in the mail which was shipped in a protective package. I love the sound of this group and can't wait to hear them live. The CD came to me quickly and in great condition. The music is absolutely wonderful and the CD is well worth the money. I'm looking forward to hearing their next one! Yes, I received the CD promptly & just fine! I love the band & all the performers. I'm giving this copy to my niece who lives in Houston, TX. I wished there was a "printer friendly" version of those great notes about the band & the background about women's bands. I would have included those notes to my niece. The bands, as well as baseball as portrayed in "A League of Their Own" got pushed aside after WWII. I'm so glad the Montclair Women's Big Band are alive & very well! Tight section work, top notch rhythm section and competent soloists. This is a recommended addition to any big band collection. If you like well-performed swing this is the CD. I've already given several copies as gifts. Tight big band with traditional stylings. This is a swinging big band that features excellent solo work as well as ensemble playing on these numbers. The classics like Caravan and String of Pearls are arranged with the original versions recognizable as foundations but sufficient new twists and turns to make these presentations interesting. I'm glad I finally bought this CD, it is great. It is Big Band music with a fresh perspective!